Just a quick report on a virus that is said to be doing the rounds on Facebook. Called Koobface it supposedly uses a fake news video about an affair between Barack Obama and Hilary Clinton to make users click on the link. According to reports online users get a video about Barack Obama posted on their walls supposedly by their friends. In fact it has been posted by the spam application which might then use it to gather spam information. People are warning not to click on the video or to try and play it. We’re not sure exactly what the results of clicking on the video are – but don’t. 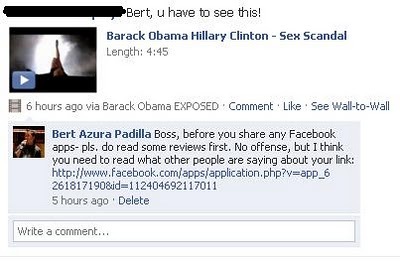 A post from cite-technologian gives the most useful information about it, saying it’s linked to an app called Barack Obama Exposed and to beware of getting notification that a friend has posted a video on your wall. first one is Copy that script second is paste in your brouser and third is hit Enter ….. When facebook user run this steps in profile this virus will activate and is spamming users profile. This type of attack is very similar to previous facebook worm attacks. These attacks are successful because many people fall for them easily and their computers are not equipped with anti-malware software. Attacks like these will continue or possible get worse until people wise up and educate themselves.